All dogs at CFAR have hips and elbows checked before breeding and all our adults receive regular checks by a veterinarian to ensure that we are breeding from healthy and robust dogs. While concerned with physical health, we are also committed to our priority of breeding from all-around sound dogs and we are just as concerned about temperament. A big beautiful dog is not practical if he is aggressive. We pride ourselves on having Tibetan Mastiffs that are not only nice-looking, but also able to be loving and trusting family members. This does not come to pass without lots of time and dedication from both the breeder and the new owners. All of our CFAR puppies are raised in the house, exposed to other dogs, and given lots of attention. They meet other family members and friends and we hope this socialization continues as they go to their new forever homes. Before leaving CFAR, all puppies are de-wormed, micro-chipped, checked by a veterinarian, and have received age appropriate vaccinations. All potential homes are screened carefully and it is our sincere hope that we will begin a lifelong friendship with new owners. We look forward to receiving regular updates on each puppy's progress as he grows to adulthood. We would very much like to continue to be each puppy's advocate for as long as he lives so, should problems arise, we remain a source of support and information. CFAR Tibetan Mastiffs encourages those thinking of acquiring a TM puppy to do as much research about this breed as possible. 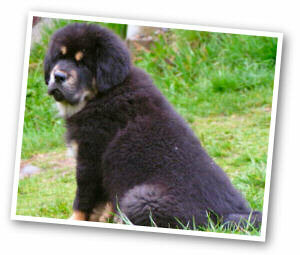 Contact and visit many breeders and obtain references to other Tibetan Mastiff owners. Do you have a fully fenced escape proof yard? Are you aware the TM can be a barker? Are you prepared that puppies can be destructive if left alone unsupervised? Do you have time to socialize your puppy every day and routinely into adulthood? Do you have a strong character to let the puppy know that you are "in charge"? It may seem cute when a fluffy puppy is challenging you, but a dominant puppy without leadership can grow to be very difficult to handle. A Tibetan Mastiff left to rule himself is not a happy Tibetan Mastiff. Take the time to discipline your new puppy with kindness and firmness. Socialize your puppy by bringing him into public situations and have friends and family come over to your home regularly. Enroll your puppy in obedience or dog handling classes. You may not like the idea of showing dogs but the interaction with other handlers and their dogs will be invaluable! Are you prepared for the many stages that a TM puppy will grow through as he matures into adulthood? Tibetan Mastiff puppies go through many changes as they mature. At each stage, the new owner must recognize behavior patterns and gently lead the puppy into adulthood with confidence. Social interactions are critical to help the puppy grow to be a calm, social member of the family. This takes a full commitment and not every family is suited to the needs or character of a Tibetan Mastiff puppy. TO ANNOUNCE OUR 2015/16 BREEDING PLANS! CFAR is pleased to announce the pairing of their beautiful gold girl, CFAR’s CIN-TSHA KAM BU (aka Princess Peach) to Polish Champion HEKTOR GOLD SENGE. The COI for this breeding is 6.9! Both parents have passed their hips and elbows certification. Princess Peach has both her majors and is pointed towards her championship. She is a tall, confident girl who is quick to show affection. She has the true guardian instincts of her ancestors but she also shows a remarkable ability to welcome people we invite in to our home and our lives. Peach is at home on the farm or in the ring. She adores children and other animals. Princess Peach’s father is Grand champion SIERRAS' SASHA - YAKONE NANUK (SASHA) Winner of two Westminster’s Best of Breed. 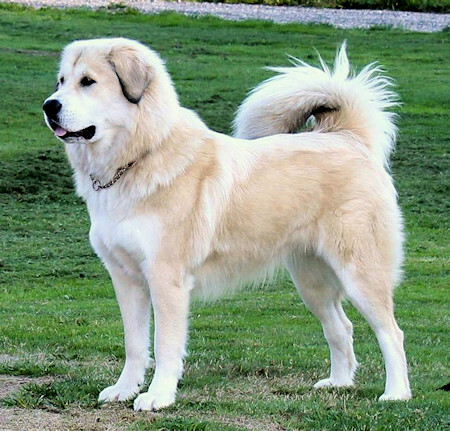 Peach’s mother CFAR'S DZAYBO SENGEMO LEGEND is a beautiful, large golden girl who gets her size and bone from her father, Grand Champion LEGEND'S KAILAS HIMALAYAN and mother, Citadel’s DON CHEN TANKA. This line in combination to the stud’s pedigree gives an excellent pedigree for bone, size and temperament and quality in the puppies. Peach is OFA GOOD, elbows NORMAL, thyroid NORMAL. 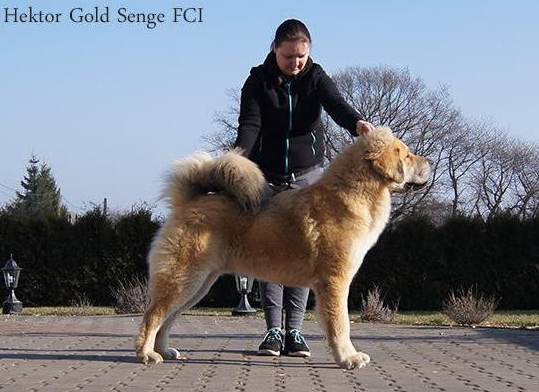 HEKTOR GOLD SENGE is the son of SENG KHRI HSIN and International Champion TASHI BOSHAY TYBETAN DREAM. Hektor is at tall boy at 33+ inches at the shoulder. He shows excellent movement as well as a sweet disposition. His conformation is wonderful. Hektor resides in Poland. We felt the addition of his lines would add to our lines as well as adding much needed diversity. Choosing Hektor was based on his temperament, size and bloodlines. We thank his breeder Elzbieta Kus for allowing us to use him in our breeding program. Hektor has Hips: HD-A Elbows: ED 0/0 Thyroid: NORMAL. We expect gold and possibly black and tan puppies from this pairing. We at CFAR not only show our dogs but also have a farm. Our dogs enjoy the lifestyle their ancestors enjoyed, watching our livestock, we also raise Tibetan yaks. Our dogs are not kenneled. They have a large dog yard with open kennels and they all are welcome in our home. Puppies are raised in our house with us and get much attention and socialization. We believe most TMs are great family dogs. A few are good show dogs. They need to use their skills that are so ingrained in them. They enjoy being on watch and that is where they truly shine. Whether taking care of the home, the family, our yaks, chickens or cats, they enjoy it all and are happy. All prospective homes will be asked to fill out a questionnaire. Please research this breed and talk to many breeders to see if this is the breed for you. If you have close neighbors, a dog that barks may not be a good choice. This breed is not a good choice for busy families that have lots of visitors coming and going. Please contact us if you would like to be considered as a home for one of our pups. MULTI-GENERATION PEDIGREE WITH PHOTOS CAN BE VIEWED HERE. Puppies from this union will be registered with the AKC.